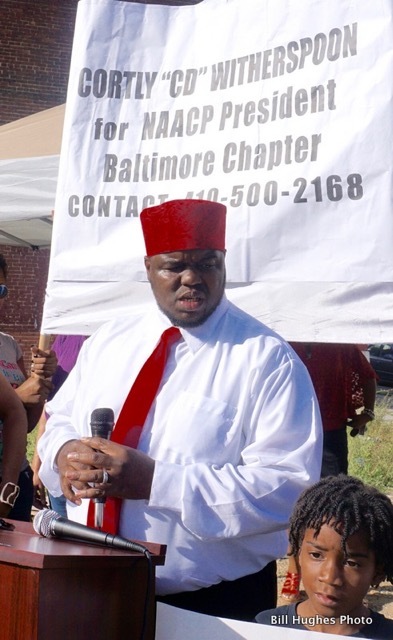 Elder Cortly D. Witherspoon is running for the office of president of the Baltimore City chapter of the NAACP. For the social justice activist, this will be his initial entry into this kind of arena. Witherspoon serves as an elder and assistant pastor at Faith Church Baltimore. It’s located in the Remington area of the City at 301 West 28th Street. Witherspoon also serves as the president of the Baltimore chapter of the Southern Christian Leadership Conference. This historic organization can trace its origins to its national founding by the Rev. Martin Luther King, Jr.
Witherspoon’s fellow activists from groups, like the “Poor People’s Campaign,” and also members of the local community whose families have been fighting hard and long for social justice and equality are supporting him. Besides Sharon Black, one of the local organizers of the Poor People’s Campaign, there were three other speakers at the event.